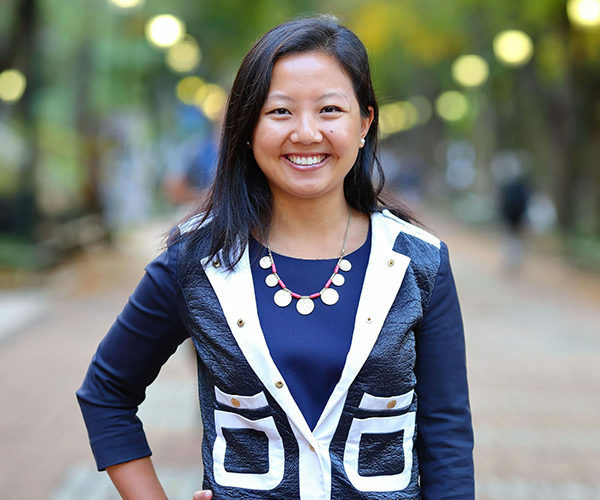 As a Social Impact Fellow with a background in consulting, Angelinda Chen, WG’18, is passionate about developing strategies for impact enterprises to benefit vulnerable populations while sustaining financial returns. Here’s what she’s learned about gender lens investing since coming to Wharton. It’s a question I often hear from classmates and colleagues when I mention my interest in the field. While many students at Wharton are interested in social impact investing, gender lens investment is still a foreign concept to many. It’s understandable why this confusion exists. As a new way of analyzing investments, gender lens investing lacks a formal set of investment criteria and returns expectation. In addition, “gender lens” investing is often used as a corporate social responsibility (CSR) initiative as opposed to a mainstream investment vehicle. I’ve been curious about the field as a consultant, and am excited to be working with the Wharton Social Impact Initiative’s gender lens investing projects to learn more about and advance the intersection of finance and gender. A gender lens is a decision-making tool, not a screen for outcomes. A common misconception, and one that I also held at the beginning of the year, is that gender lens investing is a screen for specific gender related outcomes. That is, gender is a niche investment segment with deal flow limited to products or services that only benefit women. A discussion with Joy Anderson, President of the Criterion Institute, reframed gender lens investing as a process used to make investment decisions. Gender is more than just about women beneficiaries or the number of women led businesses; it is also about the decisions regarding transportation investments or government budgets that impact men and women differently. Using gender lens involves incorporating gender into the investment analysis, understanding whether understanding gender patterns can reveal financial and social returns opportunities that might otherwise be unnoticed. We should move from counting gender to assigning value to gendered patterns. Another one of my learnings was reframing how investors can assess the value of gender within an investment. Currently, many gender metrics used in investment decisions consist of counting the number of women participants – whether it’s on boards, in the supply chain, or as entrepreneurs. Joy challenged us to expand this definition to understanding gender behavioral patterns that creates value, and how to assess for these patterns in investments. Gendered patterns are prevalent in many industries. Once I understood the concept of assigning value to gendered patterns, a light bulb went off. I started seeing these patterns in many industries and how often gendered patterns are prevalent but not always recognized. Education technology is one such industry. Women make up 76% of teachers, but only 30% of education leadership roles (e.g. principles, superintendents, etc.). The disparity in gender makeup of leadership and teachers can impact decisions about the purchase and use of education technology. What are the gender patterns in technology adoption rate and usage? Are there gender related disconnects between education technology designers and end-users? How can investors incorporate the value of technologies designed with a female end-user in the due diligence process? Gender lens investments can provide arbitrage opportunities for social and financial returns. The undervaluation of gendered patterns provides potential for investors looking for social and financial returns. Our discussion with Gayle Jennings O’Byrne, founder of Maya Ventures Partners, shone a very positive light on the social and financial opportunities of gender lens investments. In response to significant funding gaps (less than 1% of venture deals from 2012 – 2014 were done with Black or Latino women led-start-ups), Maya’s funds provide seed funding to high-growth start-ups led by Black and Latina women. Its targeted investment strategy puts Maya in a unique position to identify and nurture high growth opportunities often overlooked by mainstream investors. This story was originally published by Wharton Social Impact Initiative.